As I’ve shared before, Story Pages make up the bulk of a heritage scrapbook album. For my Grandpa Lew’s project, I was blessed to have had access to a variety of artifacts representing his vocational and recreational sides of life. I know, big words to say “Work and Play”. In this layout, I only knew the basic facts about his participation in the Swans Club, Shriners, a bowling league and working for Borden. I do not have any ‘great stories’ from each. A two page layout featuring all of these items, plus a photo of him after playing a ‘pick-up’ baseball game with friends, makes for a great story page. As you can see, I emphasized the artifacts and the journaling plays a supporting role. With all of the interest on the page in the photos of my handsome grandfather and his stuff, I kept the decorative elements to a bare minimum. Those choices makes these layouts informative and full of interest. Journaling: After the war, Lew had several jobs: driving trucks, delivering bread to homes, managing a bowling alley (Swan Lanes), and finally working for Borden’s delivering milk to homes. Lew liked ballroom dancing and he was really good. His daughters fondly remember dancing with their father. He owned a horse named Don at one point, but sold him before the girls knew anything about it. He was also active in playing a variety of sports with friends whenever he could. Journaling: During his adult life, he belonged to several clubs. Lew joined the Swan Club because his buddies were in it. He was also a Mason and part of the Shriner’s Association. Lewis was a competitive bowler on weekends. He won several watches, money, and a silver tea service. Working as a bowling alley manager certainly helped in this hobby. Lew loved to golf and watch football. He was an usher for the Ohio State University football stadium whenever his delivery schedule permitted. I can not believe she still gives this kit away for free. If you haven’t grabbed it, you should. And Amber should really consider charging a small fee for her awesome kit. Tell Amber thank you when you do. 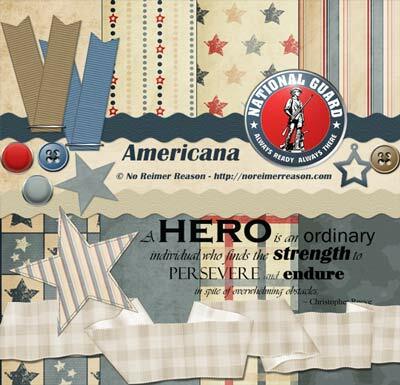 Additionally, Scrapbook.com designer Nikki Barber has a patriotic themed kit that has a lot of great embellishments in it that I felt complimented Amber’s kit nicely. I love the option to mix and match these items to create a patriotic theme with an increased variety of options. I hope you’re inspired to capture the interests of the folks in your family tree. Share a link in the comment section to your heritage scrapbook pages featuring the interests of your ancestor.